and mould issues and musty smells. The HEG Air™ Circulation System has a specific Condensation Control module that is designed to eradicate persistent, troublesome condensation from homes – GUARANTEED. We use a variety of techniques for this that are tailored to the characteristics of the house and usage habits of the occupants. Dampness-related issues, such as the occurrence of window condensation and mould in houses, have a well-documented adverse effect on health. Dust mites and mould colonies are able to thrive, thus inflaming the respiratory tract and the autoimmune system, particularly of the young and elderly. Additionally, window condensation causes water damage to window sills, curtain/blinds, bedding and clothing. Preventing it will save you in the long term, as well as reducing the musty smell associated with window condensation. Allows mould to grow on blinds, window sills, wall and ceilings – as well as clothes! 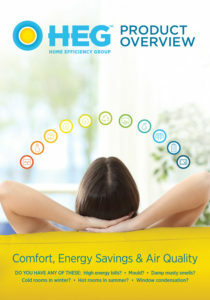 Home Efficiency Group undertakes that its condensation control systems will eradicate persistent and troublesome window condensation from your home within the ducted rooms of the dwelling. “Troublesome window condensation” is defined as large beading of moisture on windows and/or streaking condensation that runs down and pools up on sills or other surfaces to potentially cause damage, and window condensation that is persistently present to allow the formation of mould or extensive dust mite colonies. Light condensation over a small percentage of the window is to be expected on particularly cool nights/mornings as there is always moisture in the air. Sometimes the effect of the system cannot penetrate behind enclosed, reasonably draught-proof window drapes or blinds, but the condensation is usually light and will dry off before it can cause any damage. If there is a particularly cool morning, and depending on your heater type and settings, troublesome condensation may form on some mornings, but the incidence of such will be substantially reduced and usually of a much lesser nature. 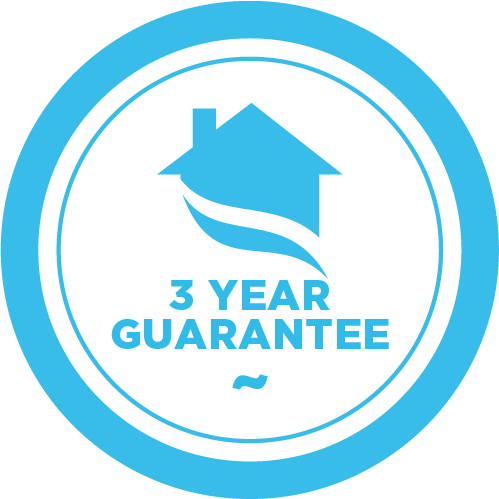 We offer a 3 year Window Condensation Control Warranty on the effectiveness of the condensation control system from the date of install of the Condensation Control module as part of the HEG Ducted Air Circulation System (HEG Air), and subject to system refinement by Home Efficiency Group or representatives, as well as householders using the system in an Approved Manner. HEG undertakes to eradicate the persistent, troublesome window condensation in rooms that are ducted to, unless these rooms have been specifically excluded from the Limited Warranty due to construction characteristics (such as a large skillion-roofed rooms where we can’t effectively penetrate ventilated air into the room). The Approved Manner includes, but is not limited to, 24 hour usage of the system, fan being left running at the prescribed flow rate, bedroom or other internal doors being left slightly ajar for the majority of the day to allow adequate circulation, adequate primary heater usage to supply sufficient heat, diffusers in affected rooms and “wet rooms” (bathroom, kitchen, etc..) being left open. Also, as we cannot determine future changes to your house, any modifications to the roof or ventilation to the roof or eave/gable may have an impact on the ducted air circulation system and condensation control module thus negating the Limited Warranty. We are only too happy to provide advice or warnings to ensure that the effectiveness of the system is not compromised.